(APN) ATLANTA — In our continuing coverage of the 2017 City of Atlanta Municipal Elections, this article presents the questionnaire responses of incumbent Councilwoman Natalyn Archibong (District 5). Archibong faces two challengers, Liliana Bakhtiari and Dan Burroughs. 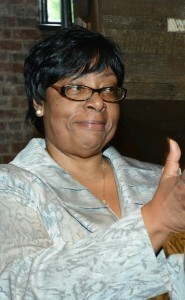 Since APN first published its Atlanta City Council Scorecard in 2009, Councilwoman Archibong has consistently had the highest score. She currently has an 82.7 on the most recent version of the Scorecard, which scores dozens of votes going back in 2003. APN has received questionnaire responses from Archibong and Bakhtiari. APN has not yet sent a questionnaire to Mr. Burroughs, but will be sending out more questionnaires shortly. Of note, in her questionnaire, Archibong committed to supporting the decriminalization of cannabis in Atlanta – meaning she should be counted as an expected “yes vote” when the ordinance by Councilman Kwanza Hall (District 2) comes up in Full Council on tomorrow, October 02, 2017. APN had previously reported that Archibong has previously been a champion of the ability of citizens to make public comment at Council Committees without a time limit. However, in recent years she has begun instituting time limits in committees where she has served as chair. In her current role as Chair of Community Development/Human Resources she has limited public comment to only three minutes at the beginning of the meeting, and another two minutes at the end. As previously reported by APN, there are often few Councilmembers, if any, remaining in the room and actually listening to the comments made at the end of the meeting. In her responses, Bakhtiari declined to distinguish herself on this issue, saying she too insists on limiting public participation in Committees using a time limit. Archibong discusses her position on the issue in the questionnaire responses below. Several Councilmembers, including Archibong, have complained about a small number of commenters who make comments that they say are irrelevant to the purview of the committee or that they may perceive as indecorous. However, the Code of Ordinances already allows Chairs to limit remarks to the subject matter of the committee, or to cut off comments that are “indecorous,” and neither of these issues are remedied by an arbitrary time limit that limits civic discourse. The only Councilmember who continues to support public comment in Committee with no time limit is Michael Julian Bond (Post 1-at-large). What is your position on the following affordable housing proposals? Surplus Property Affordable Housing ordinance 17-O-1643. Requiring that surplus city parcels that are suitable for use as housing be sold to nonprofit developers for $1 to develop affordable housing. I support the concept of Ordinance 17-O-1643, because the City must play a more active role in finding real solutions to our affordable housing crisis. Using the city’s surplus property may be a significant part of that solution. I look forward to receiving the results of the feasibility study that is currently underway, and to hearing the comments and recommendations at the work session scheduled for September 28, 2017. Converting surplus city property into affordable housing units is an idea that I support. Promoting the production and preservation of units at 0 to 30 percent AMI of the Area Median Income (AMI) across all City of Atlanta policies. This is the income bracket with the greatest and fasting growing unmet need, whereas the recent trend in City housing policies has been to produce affordable units at higher levels of AMI. Inclusionary Zoning, including as proposed in the Beltline Overlay District by Dickens et al. Requiring that new multi-family buildings include a certain percentage of affordable units, while giving incentives to the developer in the form of upzoning. I believe we should adopt a city-wide inclusionary zoning policy. Focusing on the Beltline Overlay District is important, but increasing housing costs is occurring all across Atlanta. For this reason, inclusionary zoning policies must be implemented city-wide – not just in the Beltline Overlay Districts. Adding form of housing payments (ie – Section 8 voucher) as a protected class to be protected from housing discrimination in the City of Atlanta – thus requiring that lessors cannot discriminate against an applicant solely because they have a Section 8 voucher. I would support the city of Atlanta adopting such a policy. Creating a baseline inventory of Atlanta’s existing affordable housing stock. Exploring property tax reforms, including seeking State Legislature to pass enabling laws: (1) to allow lower tax rates based on income; (2) to allow tax breaks for lessors who keep rental rates affordable; and/or (3) to allow tax breaks for nonprofit developers. I support the idea of exploring tax reforms that will result in providing incentives to developers and landlords who develop and/or maintain affordable housing rental units within the city of Atlanta. Offering grant assistance to property owners of aging multi-family apartment buildings, in return for securing promises to keep the units affordable. I support the use of CDGB and other available grant funds for this purpose. I support exploring the increased use of community land trusts. I am in support of tiny houses and accessory dwellings as a means of increasing affordable housing in our city. The city recently approved such structures in R5 zoning classifications. I support changes to our zoning policies to allow these structures throughout the city. However, such changes must be carefully vetted through our NPU system. It is imperative that our city establish an Affordable Housing Trust Fund. Use City of Atlanta median for purpose of determining Area Median Income, rather than Atlanta-Sandy Springs-Marietta. I support using City of Atlanta median income data, rather than AMI. Do you support using general fund revenue to create a public financing campaign system for Municipal Elections, much like the Democracy Voucher program in Seattle, Washington? The system in Seattle is voluntary, so candidates who do not participate in the voucher program can collect more donations that those who participate in the voucher program. For such a program to be effective, it should be mandatory for all candidates. I do support eliminating any appearance of, or actual engagement in pay-to-play. Those who support political campaigns must do so to support good government. We must ensure there is sufficient funding for our ethics and audit departments, to make sure that our contracting and procurement processes are done in accordance with the law, and not the result of influence, fear or favor. Do you support limiting or prohibiting campaign contributions from individuals doing business with the City of Atlanta, or from individuals employed by entities doing business with the City of Atlanta? The city is currently under a cloud due to federal investigations involving contractors who do business with the city. Limiting contributions from persons who do business with the city is one way to improve public confidence in government. However, it is important to note that for a city council member, the reality is that contracting and procurement is an administrative function. The council does not participate at the procurement or contract negotiation level. So, while a campaign donation to a city council candidate would not increase or assure that the donor will receive favorable consideration in bidding, procurement or contract negotiations, I am in favor of campaign finance reform that will increase the public’s trust and confidence in our government. If appointed Chair of a Council Committee, or if asked as a Committee Member to vote on a public comment policy pertaining to a Council Committee, would you be open to the idea of no time limit for public comments? If not, why not? I strongly support having public comment at the committee level. Time limits are helpful in making sure that the official responsibilities of each committee can be done in a timely manner. Some committees allow more public comment than others. The city council should standardize its policies regarding public comment at the committee level. We should also make sure that we are not doing anything that has a chilling effect on the public’s willingness to participate in committee meetings. Our committee meetings must be a welcoming place for public comment. Relatedly, would you allow citizens to make public comment on individual items as they come up on the agenda, or should public comment be restricted to the beginning and/or end of the meeting? I have served on committees were both options have been allowed. Based upon that experience, I support allowing the public to make comments on legislative items at the beginning of the committee meeting. In that way, the committee members will have the benefit of public comments prior to actually voting on a legislative item. At the conclusion of the meeting, public comment should again be allowed, so that the public can make comments on the actual vote taken by the committee. Thereafter, the public can make public comments at the full council meeting before final action is taken on legislative matters. Would you support a change to the City Charter allowing the public to comment at Work Sessions? Currently, there is only the right to comment at Full Council and Council Committee. I support allowing public comment at Council Work Session. I do not oppose codifying the right to make public comment at a committee Work Sessions. Do you believe Committee Briefings should be videotaped and made open to the public? Frankly, committee briefings should be for the benefit of the committee chair. At the briefing, the chair receives information about changes or additions to the agenda. The briefings should not be used as a pre-committee meeting. Because the briefings should be for the limited purpose of assisting the chair in the efficient conducting of the committee meeting, I do not see the need for the briefings to be videotaped. The meetings are taped recorded, and all briefings are open to the public. I do support posting the official recording of each briefing on the city’s website. Do you support reforming City of Atlanta municipal code to eliminate the possibility of jail time for possession of one ounce or less of cannabis in the City of Atlanta (i.e. – decriminalization)? Do you support extending bar hours to 4 a.m.? I am generally not opposed to extending bar hours. Do you support the increased use of solar panels and other renewable energy at City-owned buildings? How should the City of Atlanta change its policies and practices to promote more recycling by residents and businesses? We need to expand our recycling program to include glass. We need to provide increased support for the CHARM center in the recycling of hard to recycling items. The Office of Sustainability is currently working on innovative ways to increase and promote recycling by residents and businesses. I support all efforts to increase recycling in our city. Do you believe the City of Atlanta sales tax rate is too high, and would you support any portion of the sales tax rate not being renewed? If so, which portion and why? While I wish our sales tax rate was lower because of the regressive nature of such taxes, the reality is that we need this additional revenue to provide funding in critical areas. I support the continuation of the MOST, because these funds are a hedge against increasing water and sewer rates. Also, 10 percent of the funds generated from MOST are being used for storm water mitigation. I also support the continuation of T-SPLOST to meet our transportation needs. The taxpayers should carefully evaluate whether or not the E-SPLOST for rebuilding and building new schools should be renewed. To address the regressive impact of sales taxes, I am in favor of exempting necessities such as food and clothing from sales taxes. Which of the several public transportation projects that have been proposed do you think deserve the highest priority? I support the following projects: creating the new Hulsey/Krog MARTA Station, Memorial Drive Bus Rapid Transit (BRT) to connect to the Beltline, and the Streetcar extension on the eastside to connect with the Beltline. What is your plan to make Atlanta more safe for pedestrians and to provide Atlanta’s pedestrians with safe passage in the form of sidewalks? I view sidewalks as a critical component to our transportation system. I do not support issuing citations to citizens who have missing and broken sidewalks adjacent to their property. This is a responsibility the city must undertake. We need to increase funding for sidewalks and include a line item in our annual budget to address our backlog in repairing existing sidewalks, and establishing a dedicated fund for the installation new sidewalks across the city. Do you support restricting Council Office expenditures to staff and constituent outreach? Each council district is unique. I believe our current expenditure structure allows council members the flexibility to address the needs of their office and their constituents. If elected, would you still be employed in any other outside full-time or part-time employment, aside from your salaried position at City Hall? If so, what will that outside employment be? I currently work as an attorney in my own law office. When I am elected, I will continue to work as an attorney. If elected, do you commit to sitting in your chair during the public comment portions of Full Council and Committee Meetings to actually listen to the public? When I am elected, I will pay close attention to public comments. Do you support linking Councilmember salary to meeting attendance, except in the case of a documented excuse? The salary elected officials receive is based upon more than the number of meetings attended at city hall. For example, I currently sit on 4 committees while most of my colleagues sit on 3 committees. I do not expect to receive more compensation because I am a member of more committees than most of my colleagues. Also, some colleagues have all of their committee meetings on one day. I have committee meetings on all committee days. I do not believe I should receive more compensation because of this fact. Similarly, I do not believe that Committee Chairs (who arguably have more responsibilities than committee members) should receive more compensation than members who do not serve as committee chairs. Every four years, after carefully weighing our duties and responsibilities, the members of the Elected Officials Compensation Commission make salary recommendations. This year, the Commission did not recommend a salary increase for council members. I support that recommendation. DISCLOSURE: Earlier this year, APN’s News Editor received compensation for drafting an ordinance and composing a best practices paper on using surplus city property for affordable housing in the City of Atlanta. Councilman Bond, who introduced the ordinance, supported this research with a modest consulting fee. Councilwoman Archibong matched Bond’s contribution, allowing for additional research and stakeholder engagement on the surplus property ordinance. It’s interesting to me that she preaches prioritizing public comment, but rarely shows up for it herself. Also interesting that she seems to be supporting efforts around affordable housing now that we are in a housing crisis. Where was she over the last 4 years? She seriously dropped the ball there in that committee she chairs. I also have serious reservations about her answers about campaign finance, this “while a campaign donation to a city council candidate would not increase or assure that the donor will receive favorable consideration in bidding, procurement or contract negotiation” just isn’t true, and I think she is doing her best to cover her ties to some of her shadiness contributors, like Fuqua and Jafari.